As championship season continues, it’s not long before full attention goes toward summer preparation. In times like these, it’s a good opportunity for reflection to assess what we did well this winter and what can be improved. What does this mean for swimming? Preceding Erickson’s research, but in the same vein, Chambliss (1989) conducted a qualitative yet detailed assessment of elite swimmers in the 1980s, with a focus on the Mission Viejo Nadadores. (I likewise encourage a full reading of this work as well). Chambliss offers many sublime observations on the qualitative angle on what drives the best in the world…. The ultimate implication of this literature is how it affects our mindset into championship meets. 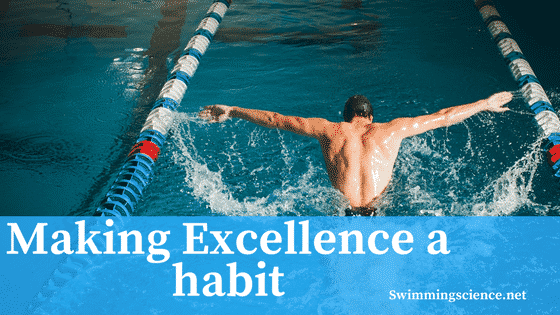 When good habits become ingrained as nothing more than routine, the swimmer no longer needs to feel as though he or she must summon superhuman powers to succeed on race day. Maybe we sabotage ourselves with the mythical qualities ascribed to the taper, but herein lies the intersection of the physical and mental. When excellence becomes mundane in practice, achievement becomes inevitable in competition. Erickson K, Krampe R, Tesch-Romer, C. The Role of Deliberate Practice in the Acquisition of Expert Performance. Psychological Review, Vol 100, No 3, 363-406, 1993. Chambliss, D. The Mundanity of Excellence: An Ethnographic Report on Stratification and Olympic Swimmers, Sociological Theory, Vol 7, No 1, (Spring 1989), 70-86.